Welcome to Laurel Grove Vacation Rentals ! This is a community of vacation homes that sits lakeside with beautiful greenery that is different than other Florida vacation homes. This neighborhood provides guests with a club house that caters to the community swimming pool, hot tub, fitness center and a beautiful lawn that the whole family can enjoy their personal entertainment on. 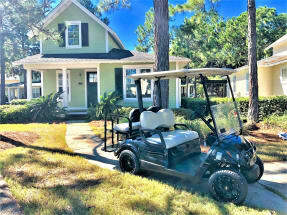 Among this community, some of the homes provide their guests with golf cart rentals so they can have the chance to explore their surroundings in a fun and unique way. Laurel Grove being located in Sandestin gives guest the opportunity to explore the beautiful village of Baytowne Wharf. Bring the entire family on down and visit one of the many family fun restaurants, stop to listen and dance to one of the live bands that are performing all night for your pleasure, and then make sure to browse around the several Floridian shops to fulfill all of your shopping needs. When you find your perfect vacation home in Laurel Grove with Emerald Coast By Owner, call the owner today to make sure you book the vacation of your life time! You can also click the Email Owner button found on each listing to send the property owner a message directly. Booking direct with the owner is the best way to assure you are not over paying for your rental. ECBYO does not charge any service fees when you book with us!